As everyone knows, Mobile Phone Usage is OFF THE HOOK! In fact, it is estimated to double or triple over the next several years. 89% INCREASE in mobile data usage from 2010 to 2011. 77% of mobile searches occur at home or at work. On average, EACH mobile search triggers nearly TWO FOLLOW-UP ACTIONS. 55% of CONVERSIONS (store visit, PHONE CALL or purchase) happen within ONE HOUR. 81% of mobile searches are driven by SPEED and Convenience. 81% of CONVERSIONS (store visit, PHONE CALL or purchase) triggered by mobile search occur within 5 HOURS. In this day and age, the FASTER and EASIER someone can access your website the better. More importantly, how your website LOOKS and FUNCTIONS in this arena is the #1 determiner of whether or not you will gain or lose a sale. This is why many companies now have Mobile Websites. The eye catching display, ease of website navigation and quick click actions are just a few of the benefits to having one. Joe Smith has just come home from vacation to a flooded basement. He needs someone to come do an emergency cleanup ASAP. What he wants is a quick, no nonsense way to find a Water Damage Restoration Company NOW. With his cell phone in hand, he begins his search. If he goes to a local business site and he cannot find a quick emergency tap-to-call tab within SECONDS, he is more likely to go to another page that has the INSTANT ACCESS he is looking for. Plain and Simple: Mobile Websites provide a mobile phone user a fast, easy, and pleasant experience when they are looking for what they need. 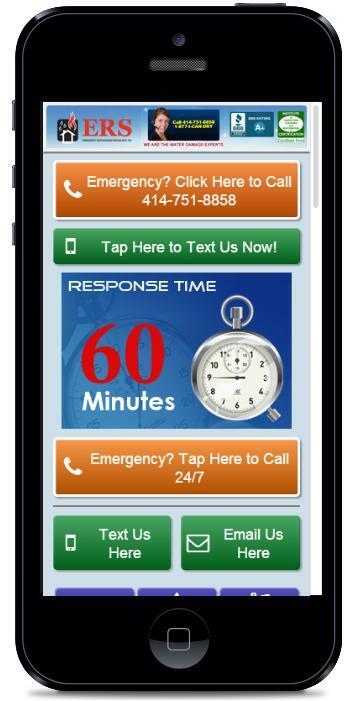 You will notice how EASY and QUICK it is for your prospects to reach you especially if it’s an EMERGENCY. If you do not have a Mobile Website, you are GIVING your sales away to the competition that does. 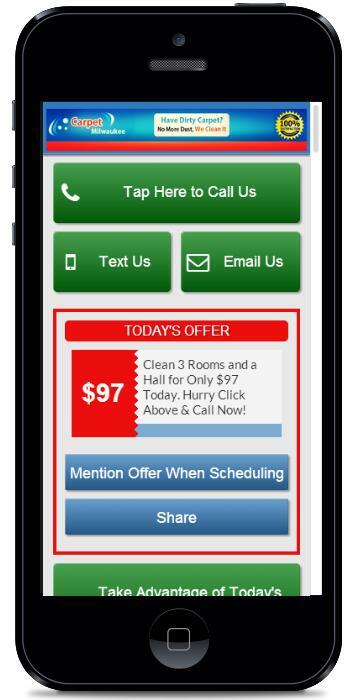 What’s even better about a Mobile Website is it a very inexpensive way to enhance and grow your business.